Ages 4 through 14. 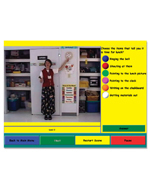 Use this computer- program to teach social interaction skills that are critical for successful communication. The Birthday Party CD teaches emotions, social language, body space, voice volume, and social context cues through familiar party situations. Requires IBM-compatible, Pentium computer with Windows 95 or higher.